WAVE is going to release the DreamTech Nishizumi Miho ( 西住 みほ ) Panzer Jacket Ver. ( パンツァージャケットVer. ) 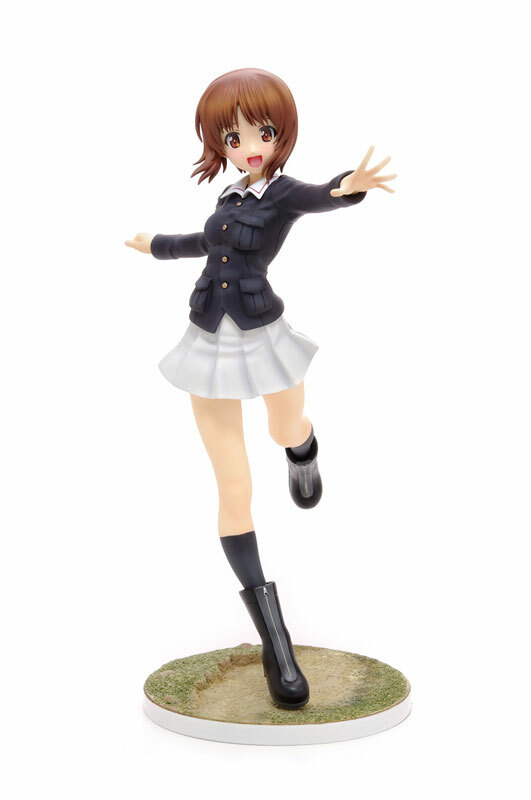 1/8 PVC figure from the anime “Girls und Panzer” ( ガールズ&パンツァー ). Will be released in February 2016. Around 220mm tall, 9,800 yen. WAVE is going to release the DreamTech Lingerie Style Charlotte Dunois ( シャルロット・デュノア ) 1/8 PVC figure from the light novel/anime “IS <Infinite Stratos>” ( IS〈インフィニット・ストラトス〉 ). Will be released in February 2016. Around 210mm tall, 9,800 yen. WAVE is going to release the DreamTech Lingerie Style Shinonono Hoki ( 篠ノ之箒 ) 1/8 PVC figure from the light novel/anime “IS <Infinite Stratos>” ( IS〈インフィニット・ストラトス〉 ). Will be released in January 2016. Around 160mm tall, 9,800 yen. WAVE is going to release the Treasure Figure Collection Beach Queens Sento Isuzu ( 千斗 いすず ) 1/10 PVC figure from the light novel/anime “Amagi Brilliant Park” ( 甘城ブリリアントパーク ). Will be released in October 2015. Around 150mm tall, 6,800 yen. WAVE is going to release the Treasure Figure Collection Beach Queens Cecilia Alcott ( セシリア・オルコット ) Ver. 2 1/10 PVC figure from the light novel/anime “IS <Infinite Stratos>” ( IS〈インフィニット・ストラトス〉 ). Will be released in August 2015. Around 120mm tall, 6,500 yen. WAVE is going to release the Treasure Figure Collection Beach Queens Tachibana Marika ( 橘万里花 ) 1/10 PVC figure from the manga/anime “Nisekoi” ( ニセコイ ). Will be released in July 2015. Around 155mm tall, 6,200 yen. WAVE is going to release the Treasure Figure Collection Beach Queens Tsugumi Seishiro ( 鶫誠士郎 ) 1/10 PVC figure from the manga/anime “Nisekoi” ( ニセコイ ). Will be released in June 2015. Around 165mm tall, 6,200 yen. WAVE is going to release the Treasure Figure Collection Beach Queens Kirisaki Chitoge ( 桐崎千棘 ) 1/10 PVC figure from the manga/anime “Nisekoi” ( ニセコイ ). Will be released in May 2015. Around 170mm tall, 6,200 yen. WAVE is going to release the Treasure Figure Collection Beach Queens Onodera Kosaki ( 小野寺小咲 ) 1/10 PVC figure from the manga/anime “Nisekoi” ( ニセコイ ). Will be released in May 2015. Around 160mm tall, 6,200 yen.